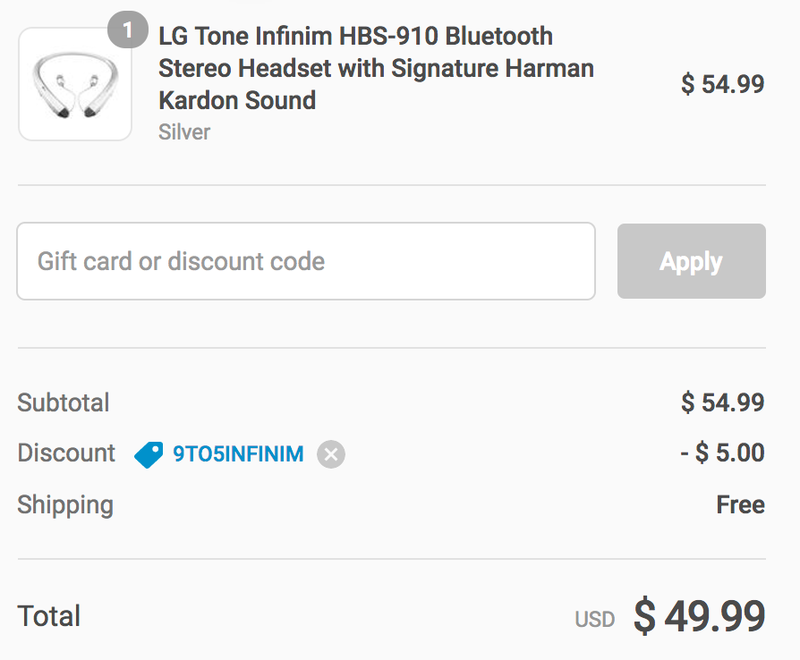 Daily Steals is offering the LG Tone Infinim HBS-910 Bluetooth Stereo Headset in three color options for $54.99, but if you use our exclusive code 9TO5INFINIM at checkout the price will drop to just $49.99 shipped. That’s $30 less than Amazon and the lowest we can find for this premium headset. Rated 4.6/5 stars by over 1,000 Amazon shoppers. Retractable Earbuds – An intuitive wire management solution with a comfortable fit. leek and Lightweight Design – Lightweight, comfortable contour with smooth, seamless style. Harman Kardon Signature Sound – Refined, full-bodied sound with rich bass. Advanced Quad-Layer Speaker Technology & Dual MEMS Microphones – Enjoy robust bass, crisp treble, less distortion on high frequencies, and exceptional voice clarity. The LG HBS-910 Tone INFINIM Wireless Stereo Headset curves around the neck for a secure comfortable fit with retractable ear buds and Harman Kardon signature sound. Featuring dual MEMS (Micro Electro-Mechanical Systems) noise-cancelling microphones for better call quality, the headset can be used to connect to several audio listening devices such as smartphones, MP3 players, CD players, and other portables. In addition, the quad-layer speaker technology offers richer bass and crisper highs.